We folded a square piece of paper as described in the Illustrative Mathematics task, Origami Regular Octagon. 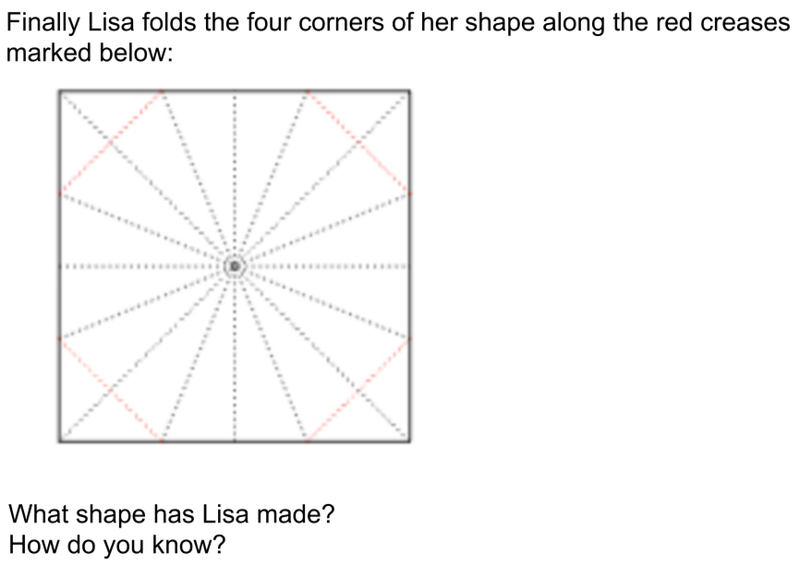 I didn’t want students to know ahead of time that they were creating an octagon, so I changed the wording a bit. We folded (and refolded … luckily, there was not a 1-1 correspondence between paper squares and students). Students worked individually to write down a few observations and then we talked all together. There are 8 equal sides. There are 8 equal angles. It’s a regular octagon (this is the first year my students have come to me knowing what it means for a polygon to be regular). How do you know there are 8 equal sides and 8 equal angles? Because we folded it that way. Because one side is a reflection of its opposite side about the line that we folded. What is the significance of the lines that you folded? They are lines of symmetry. The opposite sides are parallel. This took a while. Maybe longer than it needed to. Another student raised his hand. 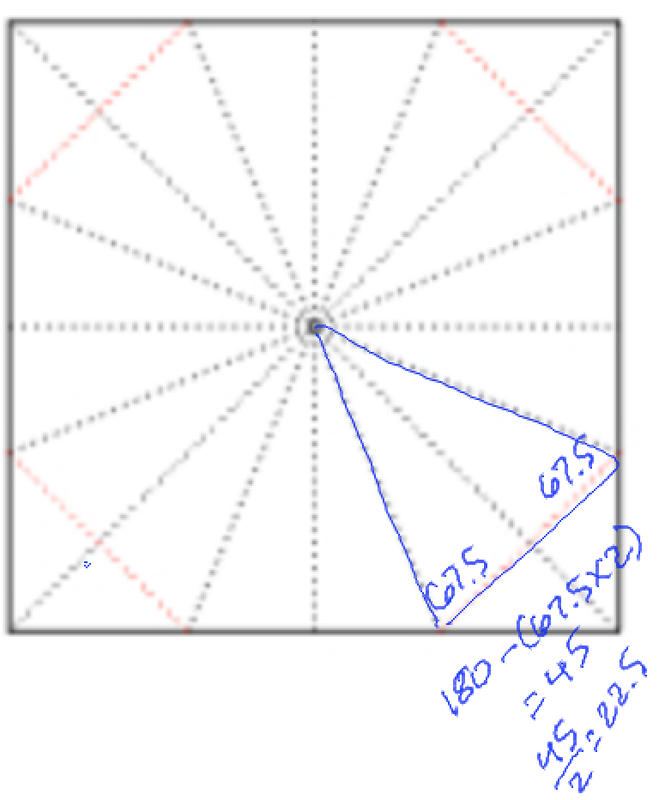 I figured out that the sum of the angles in the octagon is 540˚. 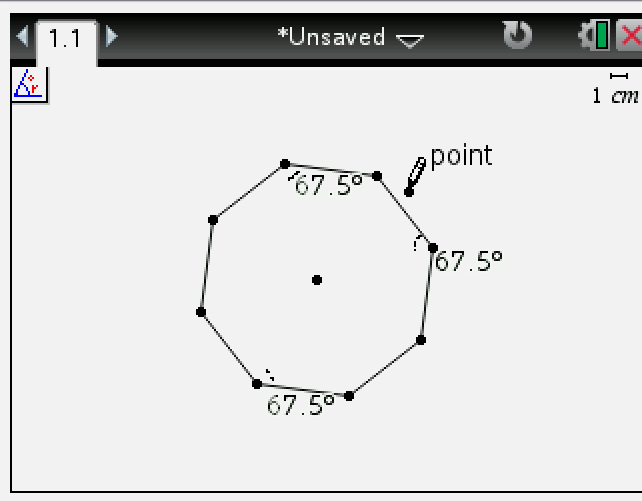 I made an octagon and measured the angle. Then I multiplied by 8. Okay. Let’s see what you have. I made him Live Presenter. He showed us the angles he measured that were 67.5˚. It might help if we can see the sides of your angles. 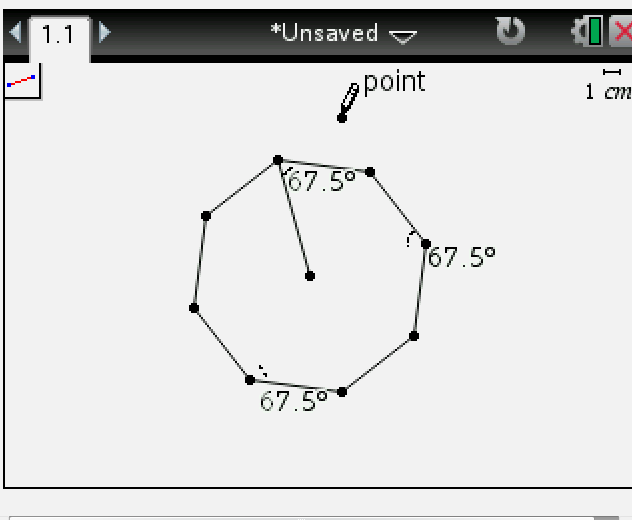 Will you use the segment tool to draw them? 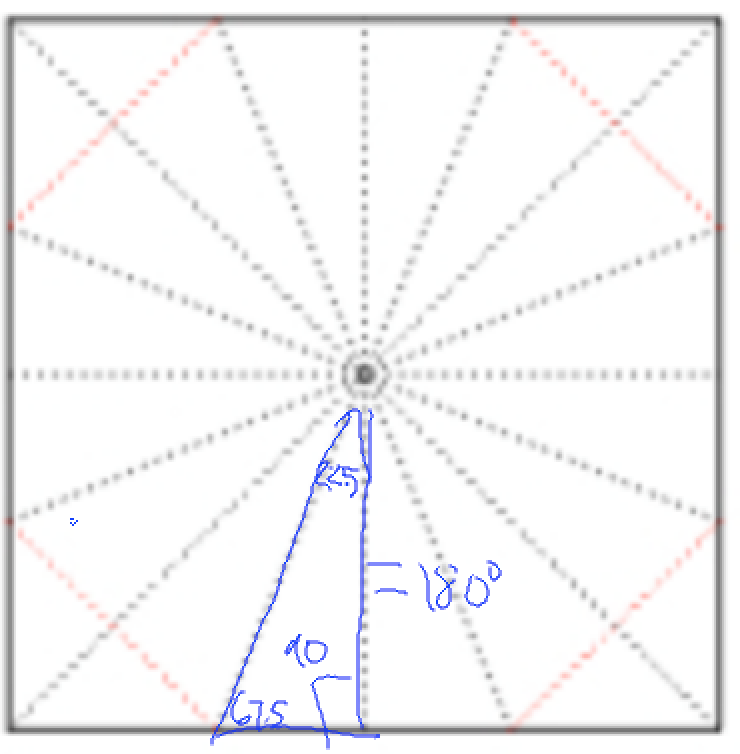 Other students argued that we needed to double 540 to get the sum of the angles in the octagon, 1080˚. Students noticed different numbers of triangles. And they recognized that we knew about congruence because of reflections. 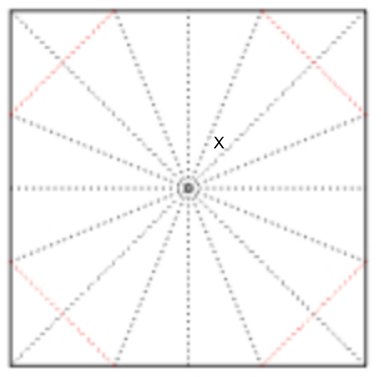 Somehow we asked the question about the value of the angle (x). I set up a Quick Poll to collect student responses. 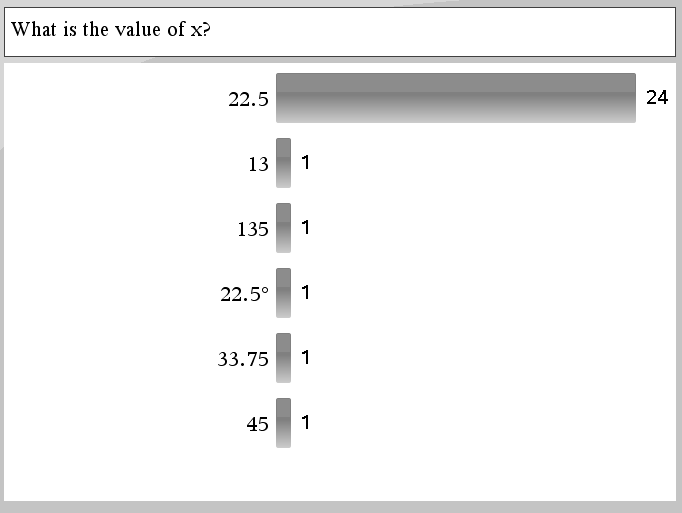 Almost everyone got the correct answer of 22.5˚. 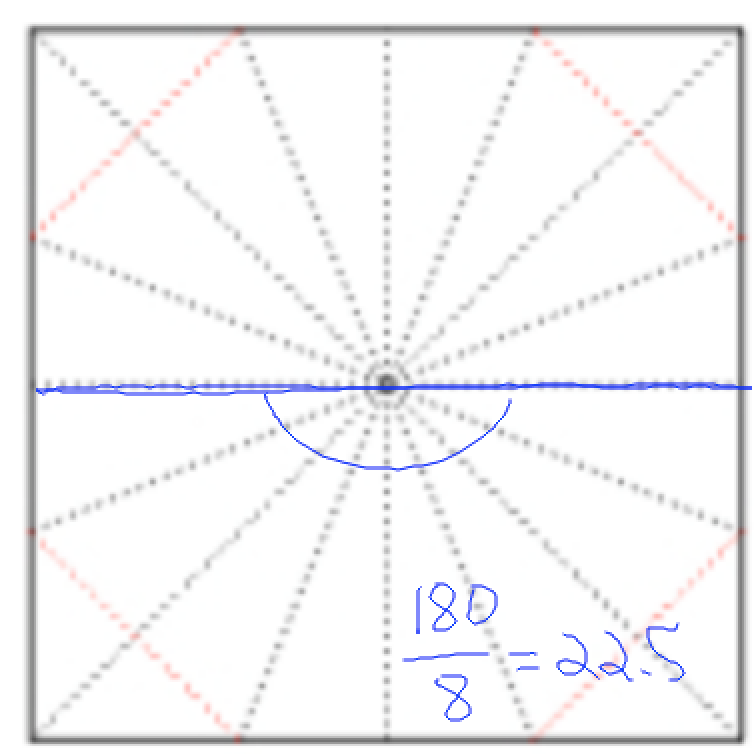 One student used the ¼ square with a 90˚ angle that had been bisected by the folded line to be 45˚ and the bisected again by the folded line to argue that x was 22.5˚. Did anyone do something different? Hands went up all around the room. AC hasn’t talked to the whole class yet today, so I asked what she did. 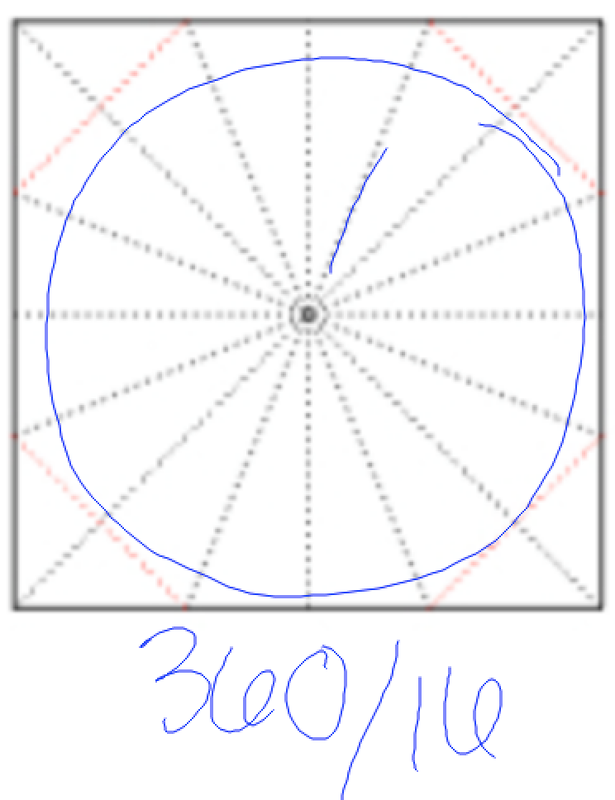 I saw a circle with 360˚ and divided by 16. Then DC’s hand went up. 360/16 is equivalent to 180/8. 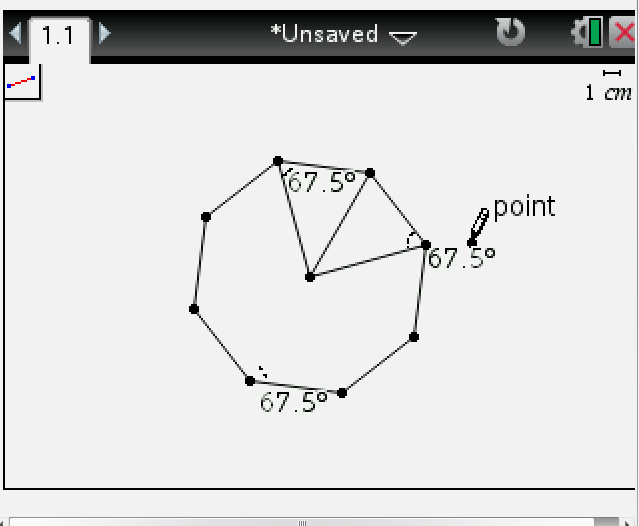 I saw a line divided into 8 equal parts (or straight angle). Then TC showed us the isosceles triangle she used with the 62.5˚ base angles. Then someone else showed us the right triangle he used with the complementary acute angles. Before we knew it, we had spent almost an hour talking about a regular octagon. And learning math using quite a few Math Practices: construct a viable argument and critique the reasoning of others, look for and make use of structure, use appropriate tools strategically.